Usually when one speaks of fractals to an audience, the audience refers to a piece of art that consists of repeating shapes and self-similar patterning (“same as near as far”). However, they do not realize that fractals were made and recognized due to a mathematical concept that was developed by many people such as Gottfried Leibniz, Georg Cantor, Waclaw Sierpiński, Gaston Julia, and Benoit Mandelbrot. Mandelbrot was the one to coin the term “fractal”, but the other mathematicians paved the way for Mandelbrot’s findings. 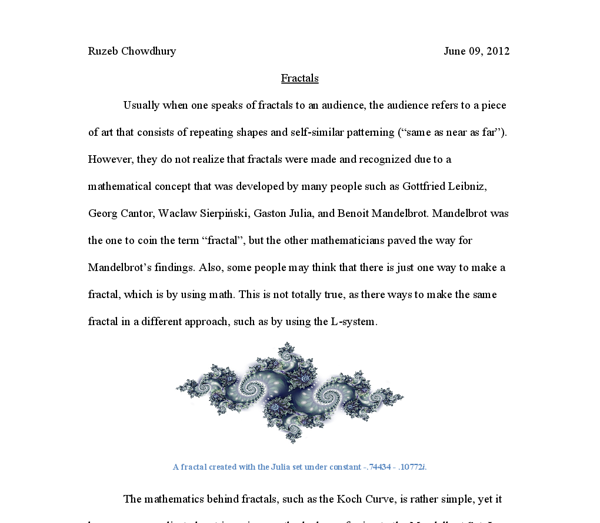 Also, some people may think that there is just one way to make a fractal, which is by using math. This is not totally true, as there ways to make the same fractal in a different approach, such as by using the L-system. 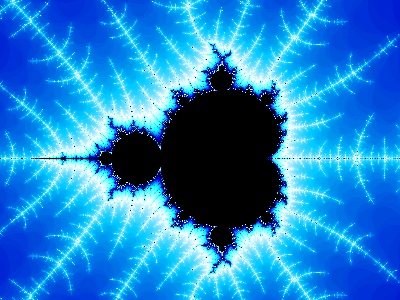 A fractal created with the Julia set under constant -.74434 - .10772i. The mathematics behind fractals, such as the Koch Curve, is rather simple, yet it becomes a complicated, yet ingenious method when referring to the Mandelbrot Set. 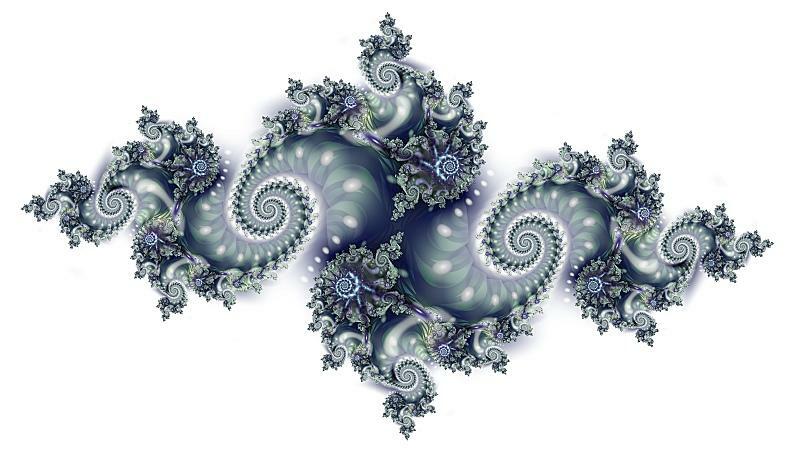 In order to create a fractal, you will need to be acquainted with complex numbers. Complex numbers on a graph are characterized by the coordinates of (x,y) in which the x-coordinate is any rational number, whereas the y-coordinate contains an imaginary number, denoted by “i”. An imaginary number is the square root of a negative number. An example of a complex number can be: (5 + 4i). In order to create the Mandelbrot Fractal, we just ask the computer to color the pixels black if the value of c is bounded; else we color the pixel white if it goes to infinity. Different colors were determined by the quickness of the equation to go until infinity, thus the presence of blue in the image below. French mathematician Gaston Julia had published her work at the age of 25, yet it was not recognized as an input to the mathematical world until after about sixty years, when computers were able to visualize Julia’s creation. Similarly, to find the dimension of a fractal, we use the same formula. The Sierpińksi Triangle consists of three self-similar pieces under the magnification of two. The fractal dimension of the Sierpińksi triangle is approximately 1.58, less than a square yet more than a line. Fractal dimension is the measure of how "complicated" a self-similar figure is and how large it is. The Sierpińksi triangle is more complicated than the Koch Curve (1.26) and the Cantor Dust (.63), thus it is larger than them. “Creating Fractals: The Mathematics.” Adam Lerer. Angelfire. n.d. Web. 25 May. 2012. “Escape Criterion.” Professor Michael Frame. classes.yale.edu. Fall 2000. Web. 2 June. “Fractal Dimension.” Professor Robert L. Devaney. Boston University. 2 April. 1995. “Fractals and Fractal Geometry.” Thinkquest.org. Oracle Thinkquest. n.d. Web. 23 May. “Julia Set Generator.” www.easyfractalgenerator.com. n.d. Web. 5 June. 2012. “Julia Sets.” Professor Michael Frame. classes.yale.edu. Fall 2000. Web. 2 June. 2012. “L-system.” Wikipedia.org. n.d. Web. 30 May. 2012. “Mandelbrot Calculator.” Gary Rubinstein. MATHE 6500C. 2009. Web. 26 May. 2012. Mandelbrot, Benoit. The Fractal Geometry of Nature. U.S.A: Macmillan, 1983. Print. "The Math of Fractals." Coolmath.com. Coolmath.com, Inc., n.d. Web. 22 May. 1 2 1.001 2.006006002 6.012006 x x3 2x3 gradient 1 1 2 6 2 8 16 24 3 27 54 54 4 64 128 96 After looking through each value, I have observed a pattern. I have noticed that the gradient is always equal to 6x�. Use the same data as the previous equation to gain the equatipon.we can gain new equation as below: LC=+1.001*LY_1-0.002921*p According to the tests which display in the Table 6, we can see that the coefficients of both parameters are significant as the value of t-test are quit high. use something called "the perfect" gas which is a prime example of a gas to use. This gas will half in volume exactly when the pressure is doubled. Unfortunately there isn't a gas known to man that does this and air is the closest example, if there is a gas which is perfect and we discover it remains a mystery. 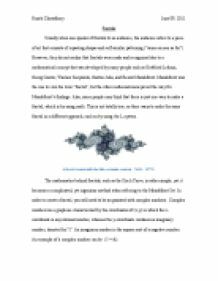 one then goes beyond it, taking that interpretation at a signifier itself, for which there is a signified, which represents the new understanding of the text. What I want to suggest is that this third order understanding is best described as irony and the kind of understanding is yields a post-modern understanding of the text. Similarly, if the three games' chances of winning anything are compared versus their entry price: Table 8: Comparison of games by odds Case Maximum Payoff Odds Entry price 1 $2000000 1/108140 $1 2 $ 1/4 $5 3 $1000000 1/24 $100 When considering entry price E, its value depends on two things, odds of winning and potential payoff. denominator in the roots, therefore we can assert at this stage that the numerator is independent of the first term coefficient and dependant on the fourth, while the denominator is independent of the fourth term coefficient and while dependant on the first.